No debate around Canadian football sets off a firestorm like the one over how many Canadians should be guaranteed jobs on each CFL team. That’s why a report Saturday on 3downnation.com suggesting that the CFL and CFLPA are in favour of reducing the required number of Canadian starters on each team, from seven to five, struck an emotional chord (CFLPA executive director Brian Ramsay has denied the report). The nature of the ratio cuts to the heart of the league and leads to some uncomfortable truths along the way, with no right or wrong answer waiting at the end. To fully understand the dynamics of the debate you must first understand the dynamics of a CFL locker room. Teams are comprised of a roughly 50/50 split between Canadians and Americans. 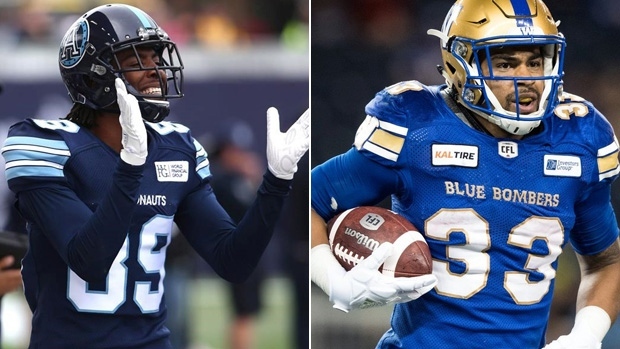 With a limited supply of Canadian professional football talent, Canadian players in the CFL often enjoy long careers and the benefits of supply and demand on their salaries along the way. American players can earn decent CFL paydays once they become stars, but a Canadian of equal ability will always be worth more and thus, paid accordingly. So one can certainly understand why some American players aren’t fans of a rule that guarantees 21 spots on every team to Canadians, including seven starting spots. To many, the idea of a birth certificate translating into better job security and compensation just doesn’t feel right. Canadian players, meanwhile, believe they are the essence of the CFL. They also believe that teams wouldn’t take the time to invest in their potential without a ratio protecting their roster spots. They like to believe they are as good as the Americans in the CFL, but want the job protection to prove it. How many Canadians would be in the CFL without a ratio? It’s impossible to say, but in an open market the league would be overwhelmingly American. Whether you consider that a good or bad thing depends on your perspective. Casual fans may understand or care little about the ratio and simply want to watch the best available players. This all helps explain the debate that surfaced on Twitter among players this week: How much do the Canadian players really matter to the business of the CFL? Canadian players insist with conviction that the league couldn’t exist without them. But with so many of the league’s star players being American, is that really true? There are no shortage of opinions on that among fans, players and people within the game. The players jumping on social media this week to debate the ratio is simply the public unleashing of the disparate views that exist in every CFL locker room on this issue. The teams are the other party in this debate. Are they telling the league office they’d like to see the ratio drop? There’s plenty of speculation about that. Many general managers say it’s challenging to find seven quality Canadians and seven quality backups, and believe their jobs would be easier and the league would be better if that number were five – especially with potential expansion on the way. Of course, there’s no correct answer to how many Canadians should be starting. Consider that in the mid-1990s, each CFL team was required to start 10 Canadians, meaning there were 90 starting jobs for Canadians. That was before three francophone universities started pumping out players from Quebec and before Canadian players crossed the border for NCAA scholarships to the degree they do today. Despite that increase in supply and overall quality of play in Canada, today’s teams complain about not being able to find Canadians for the 63 starting jobs in the league. The lesson is that no matter what you make the number, someone can argue the game would be better if it were lower. Whether that’s true is purely in the eye of the beholder.